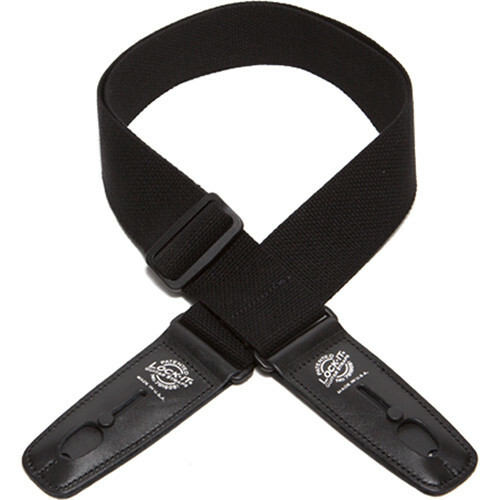 2" Wide & Adjusts from 36 to 60"
The black with black ends 2" Cotton Series Guitar Strap from Lock-It features 100% spun cotton fibers with a built-in snap-action lock to prevent the instrument from becoming unfastened. It can be used by musicians wanting a softer feel, more comfort, and less shoulder slip than a poly strap. The guitar strap is adjustable from 36 to 60" and can be used with a built-in thumb-back button, which securely attaches it over the guitar's end-pin and locks the strap securely in place. The snap-action locks are made of polymer-alloy components for toughness, long life, and durability. A specially designed spring powers automatic locking and assures lock recovery. Plus, it has been designed to bend, take abuse, and remain working for many years.